Australian researchers have found trace amounts of gold in the leaves of Eucalyptus trees. Now, we’re not talking about a lot of gold — but these amounts are strong indication of larger deposits lying beneath. "There's Gold in Them Thar Trees!" The discovery of gold in leaves is nothing new. Scientists used to think that tiny particles of the precious mineral were sucked up by trees after being blown there by the wind. 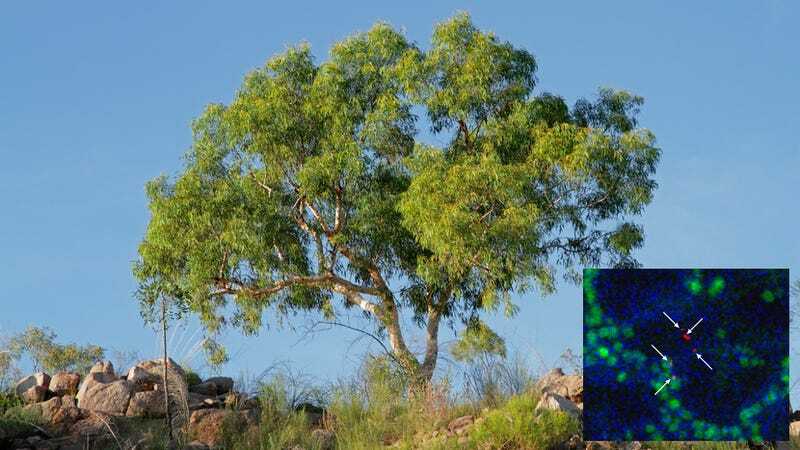 But geochemists from Australia’s Commonwealth Scientific and Industrial Research Organisation (CSIRO) have now confirmed that gold particles in the foliage of Eucalyptus trees is a sure sign that deposits are buried many feet below. This connection between vegetation and buried mineral deposits could prove instrumental in developing new technologies for gold exploration. No doubt, it’s getting tougher and tougher to find. Two years ago, the U.S. Geological Survey said there were 51,000 tons of gold left in the world’s reserves, and the price of gold has skyrocketed over the past 13 years. What’s more, it’s crucial for manufacturing, including its use in electronics and medical technology (like cancer treatment). To make the discovery, a research team led by Mel Lintern used a futuristically-sounding device called a synchrotron — a machine that uses X-rays to probe material in excruciating detail (like the nuclei of iron). This tool allowed the geochemists to find traces of gold in the leaves, twigs, and the bark of some trees. But to give you an idea of just how tiny these amounts of gold really are, you would need 500 trees growing over a substantial deposit to produce enough gold in the trees to make a gold ring. But that’s not the point. The trees are serving as markers, indicators that more lies beneath — and typically no more than 100 feet (30 m) deep. The leaves biochemically adsorb the gold particularly where thick sediments dominate. According to Lintern, the trees are essentially acting like hydraulic pumps, bringing precious water up from the deepest roots. At the same time, however, the water is also bringing dissolved gold particles up through the vascular system into the foliage. And because gold is toxic to trees, it’s shunted to the tree’s extremities, like its leaves. Over time, this also leads to higher levels of gold in the soil surrounding the trees as its leaves fall and are reabsorbed into the soil. Additional information via BBC and Telegraph | Images via Mel Lintern/Nature Communications; EcoPrint/Shutterstock.